The turkey playdough play set. These would make great busy hands for the 3-5 year old crowd...especially handy during food preparation time on the big day. Included is orange playdough (with a hint of red glitter for extra pizazz), googly eyes, orange foam beak, colorful feathers and pipe cleaner feet. 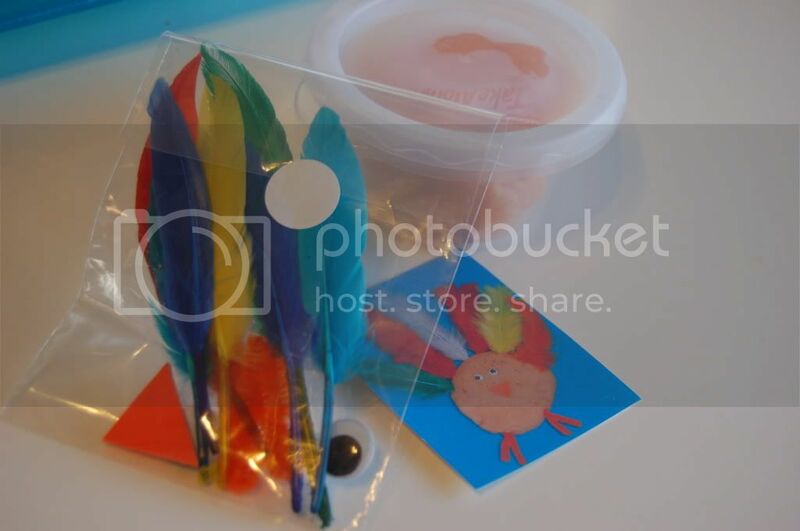 I actually made these little kits for Micah's preschool Thanksgiving party for party favors. I really didn't want anything edible for the favors since they will have their fill of treats at the party, so this is what I came up with. Cut triangles from foam sheet and cut 2" sections of the pipe cleaners. Fold pipe cleaner in half then twist at top. In a ziplock or similar bag put 2 feet, 2 eyes, one beak, lots of feathers and perhaps a picture of a completed turkey (you can use mine above if you like) so they have an idea of what to do. I put my playdough in these Rubbermaid takealong containers found at my grocery store. You could use a ziplock instead. 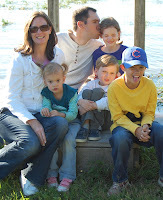 Now all your toddler has to do is mash down the dough and stick in a face, feathers and feet as they like. Outstanding and super cute idea!